RS: There's been, again, just very close to the ground, a speculation in the media that Secretary Clinton would be the fall guy for the embarrassment that you've caused the U.S. and the State Department. Would her resignation or firing be an outcome that you would want out of this? JA: I believe ... I don't think it would make much of a difference either way. But she should resign if it can be shown that she was responsible for ordering U.S. diplomatic figures to engage in espionage in the United Nations, in violation of the international covenants to which the U.S. has signed up. Yes, she should resign over that. RS: Let me ask you what the future has in store for you and WikiLeaks. You've been quoted recently as saying your next target is Big Business and/or Wall Street. What's next coming down the pipe? JA: We don't have targets, other than organizations that use secrecy to conceal unjust behavior ... that's created a general target. Otherwise we're completely source-dependent. We are a source-protection organization and a publishing-protection organization. Quite a bit of our effort, historically, has been taking articles from journalists who were censored or a book that was censored and republishing them as a way of disarming the censorship [inaudible]. But yes, we have a lot of source material that ... collection that remains unpublished. And that is actually something not to be proud of, but rather a great distress to us. We don't have the resources that are required to get through this very valuable material and sources that are given to us, those past sources are given to us ... We're working on various mechanisms to speed that up and to acquire those resources. So yes, the banks are in there, many different multinational organizations are in the upcoming weeks, but that is a continuation of what we have been doing for the past four years. However, there are greater volumes of material, that is true. The upcoming bank material is 10,000 documents, as opposed to hundreds, which we have gotten in the other cases. RS: And are there any, Mr. Assange, any more documents from this latest dump that will be coming out in the next days or weeks? JA: Yes, we're doing about 80 a day, presently, and that will gradually step up as the other media partners kick in. RS: And as you were saying, do you review every document before you release it? JA: All the Cablegate documents, every document is the backing document to a story appearing on a news website or in a newspaper or on a TV program or that we ourselves have released as an analysis. So yes, they're all reviewed and they're all redacted, either by us or by the newspapers concerned. RS: And how  and I know we're running out of time, but  and the standards by which you do the redaction, how would you define that? JA: Carefully. Also, what we have asked the State Department, we have formally asked the State Department for assistance with that. That request was formally rejected, and they also refused to engage in any harmonization [variant: harm minimization] negotiation. So that tends to lead us to the view, given what we think about it, that they've being working on the material for some four months now, and we have intelligence of many organizations and individuals [inaudible] have been contacted by the State Department. They do not believe that there are many people that would be vulnerable, but we are still conducting with [inaudible], and the New York Times, the State Department already mentioned eight broad areas of concern. And some of those were people trying to cover up some embarrassing activities, which the New York Times also rightfully rejected. RS: Mr. Assange, I think we've run out of time. I appreciate your having taken the time to talk to us. I hope you will do so again. 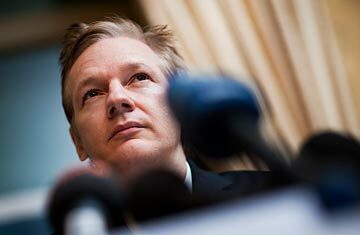 See TIME's video "WikiLeaks' Assange on China's 'Reform Potential.' "
Read "TIME Interview: Assange on Secrecy, China and WikiLeaks' Growth."